People in Berwyn Heights know Sportland as the historic house that sits apart from the rows of ramblers on Natasha Drive. It is also the single best link to a past that predates the founding of Berwyn Heights and goes back to the beginnings of Prince George’s County. Although the home is not grand in comparison to other Prince George’s mansions, it had a number of prominent owners. The house and its owners are described in a Maryland Historical Trust Inventory, authored by county historian Susan Pearl, on which the following is based. The original dwelling stood on a tract of land named “Yarrow” that James Edmonston (ca 1740 – 1793) inherited from his father, Captain James Edmonston (1699 – 1753).¹ The Edmonstons were an influential family in colonial Prince George’s County. James’ grandfather, Archibald Edmonston (ca. 1670 – 1734), said to be a descendent of Sir James Edmonstone of Duntreath, Scotland,² was one of the wealthiest landowners in Prince George’s County, at a time when it encompassed the areas of Washington, D.C. Montgomery County, and Frederick County. Yarrow was resurveyed in 1768, and the 522 acre tract was officially patented to James. A record of a house on the property first appears in the federal tax rolls of 1798. At that time, the widow Ruth Edmonston lived there in a modest 1 story frame house with brick chimneys at each gable end. Upon her death, the property passed to her nephew Nathan Edmonston, who sold it to Benjamin and Richard Welsh in 1820. The Welsh family held the land for another 30 years and farmed it with the help of 20 slaves. Around 1850, the heirs of Benjamin Welsh sold part of the property to Ethan Allen Jones, who served as a delegate in the Maryland Assembly from 1860 to 1861. Jones was married to Laura Deakins, a daughter of Colonel Leonard Deakins. The Deakins’ owned the Bloomfield farm on which the Town of University Park now stands. The Jones’ built the 2 ½ story addition that is attached to the smaller, original dwelling. 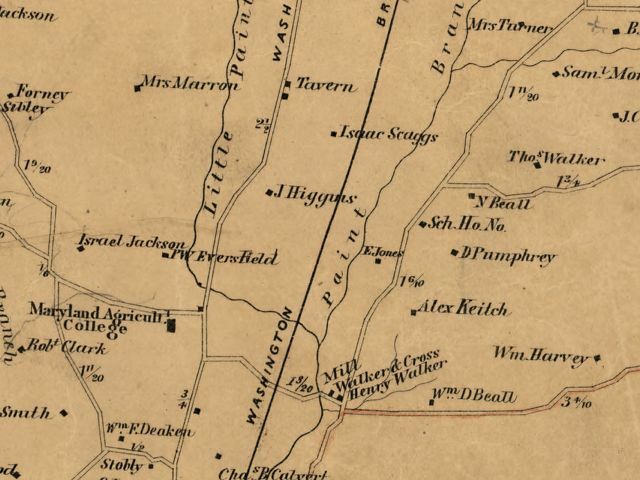 Ethan Allen Jones notably served on a commission, which in 1858 established a free school in the Vansville District of Prince George’s County, located a short distance northeast of the Yarrow home.³ An 1861 Martenet map of the area confirms that a school was located in the vicinity of where Pinegrove Academy would be constructed in 1889. Jones died in 1863 and his heirs had to sell the property because of an unpaid debt. In 1865, they sold 274 acres, to Jonathan T. Walker (1811-1885), who owned the estate north of Yarrow. Walker was a builder and successful businessman in Washington D.C., but removed to Prince George’s County when the Civil War broke out. He was also a grandson of Isaac Walker, who had fled Scotland with his brothers Charles and Nathan when a rebellion of Scottish chiefs against King George I of England failed. Upon their arrival in America in 1746, they settled in Prince George’s County, and built a log house they named “Toaping Castle,” after their family stronghold in Scotland. Their house stood where the Golden Triangle in Greenbelt is located today. In 1869, Walker sold 150 acres of Yarrow, including the house, to Edward C. Carrington. Carrington had fought in the Mexican War and served in the Virginia legislature before being appointed Brigadier General of the District Militia in 1861.4 It was during Carrington’s ownership the property became known as Sportland. In 1874, Carrington sold most of the land to Ada and Elsie Joyner, and they sold it to James E. Waugh, who with Edward Graves, Benjamin Charlton and a group of Washington investors in 1888 established the suburb of Charlton Heights. The Carrington family continued to live at Sportland, which now comprised the house and a much smaller plot of 28 acres, until 1903. The next proprietor, August Wiegman. divided the property again, selling half to Lillian Hough, who sold it to Maria and John O. Waters in 1915. The Waters held the property until 1937, then conveyed it to their daughter, Theresa Downey and her husband, who owned it until 1951. John Waters is remembered for having opened the controversial Sportland boxing ring in 1922 that is the subject of the BHHC’s 2013 historic marker.